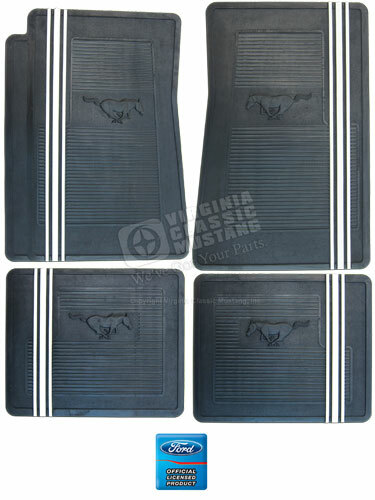 Black Mustang Rubber Floor Mat Set with Molded Running Horses and White Racing Stripes. When the Ford Mustang was introduced in 1964, it obviously became wildly popular very quickly. Lots of aftermarket suppliers wanted to jump on the band wagon of success and produce parts for the new Mustang. Some of these parts were not so great, but some were even better than the factory parts offered through Ford. One of the neatest parts was a set of Floor Mats. These particular floor mat sets with white racing stripes were very popular back in the sixties. 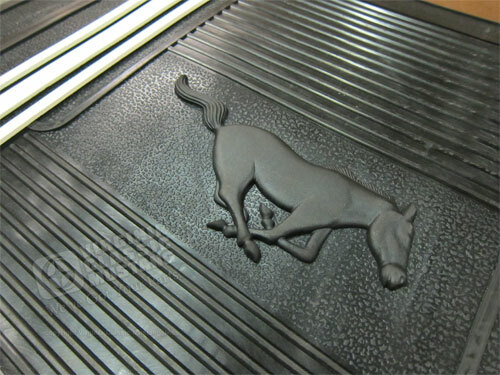 We have a great reproduction of these floor mats. We have been out of them for a while, but they are available and in stock again! 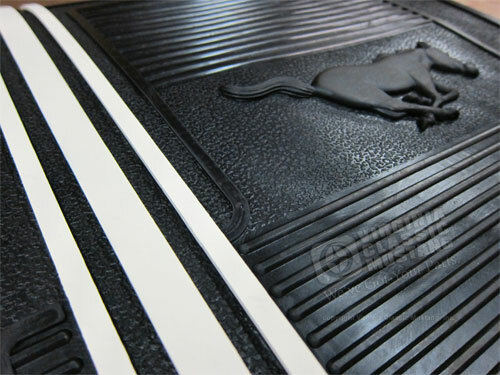 These floor mats feature a molded Running Horse emblem along with molded in White Racing Stripes. They are great looking mats! The front driver's side mat even features a trim line for convertible installations. They are sold in a set of four and are only available in Black with the White Racing Stripes. Our part number is ST-912.